A visit to Live & Breathe Pilates changed my outlook towards exercise and kickstarted my journey towards health. Due to personal reasons I took an extended leave of absence from exercise. Mentally and emotionally I was overstretched, so in my infinite wisdom, I decided to not do any physical activity whatsoever. Apart from lifting food to my mouth and lowering myself onto the couch that is. This, I believed, was a foolproof way to deal with the stress – don’t do anything to your body that Mr Creosote from Monthy Python wouldn’t do. ‘I’ll give myself a nice long year’ I thought, ‘and then I’ll jump back in guns blazing. No excuses. Watch out world!” The year did seem nice and long at first, well, for the initial eight or nine months. And then when it got closer to the end, why, it didn’t seem all that long at all. That was a cruel trick, Time! I was going to have to get up off the couch. Yuck. ‘Okay, so I promised myself I’d get back into the exercise game. What’s the best way to do it that won’t kill me with the sudden shock of effort?’ I wondered. Years before, after a few months of pilates classes, my boyfriend had commented it was the first time he had ever seen my body actually change shape from exercise. I was more of an endurance race, boot camp, gruelling, sweaty exercise fan, so to hear him say this relatively more gentle form of exercise was the first time he noticed a dramatic change was really memorable. And really annoying. When I visited the wonderfully peaceful Live & Breath Pilates studio for the first time, I met Steph, who gave me an assessment and discussed what my aims were from the ten classes I had signed up for. She brought me through a range of exercises, both on the mat and on the reformer. The reformer looks like one of those machines you would never go near in the gym as you’d never figure out how to work it. I would end up loving the reformer. Steph also asked if I wore an orthopaedic as my posture was all over the place (my words). Looked like I’d been on that couch a bit too much! No wonder I was seeing the world at a slant. My first few classes were on the reformer. One thing that’s really important about pilates is getting the right form, holding and moving your body correctly. Small movements then have big consequences. The reformer is a way to help your body find those positions. About five minutes into my return to pilates, I thought, this isn’t difficult, but it’s not super easy. It’s not just sitting on a mat. A couple of classes later, the instructor told me I had already advanced onto the next level. 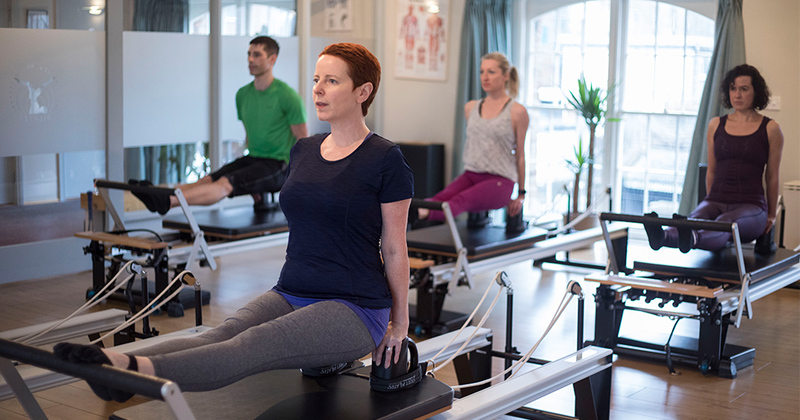 With these new classes on the mat, what we had learned on the reformer was put to use, as this time moving my body correctly was up to me. The talented (and rather witty) instructors were on hand to give gentle corrections, encouragement and challenge us a little. At the end of each session, I would remember just why I had loved pilates so much all those years before. The power of a good class. Towards the end of those ten classes, I didn’t need my boyfriend to tell me- I could see my body was starting to change. Pilates is the absolute best thing for your core, so because I carry most weight in my stomach, it’s ideal. This relaunch into the world of exercise and activity had a knock on effect. Becoming more physically active made me want to be even more physically active and it lifted my mental health hugely. 16 January, 2019 . Written by Peter Dunne .